We report the case of a 44-year old female subject who presented with a single subcutaneous swelling on the right temporal scalp of a week's duration. On examination, the swelling was not painful, non-mobile, and moderate-to-hard in consistency. No increase in size was noted in 1 week. There was no history of fever. Clinical features were suggestive of an osteoma, and the excision of the same was planned. The patient underwent excision of the swelling. On excision of the subcutaneous layer and resection of the base, multiple, live filament-like worms were extracted from the swelling. Specimens were collected and sent for histopathological examination. Wound closure was done after debridement and cleaning. Both the filamentous worms and the abscess capsule were sent for histopathological examination. 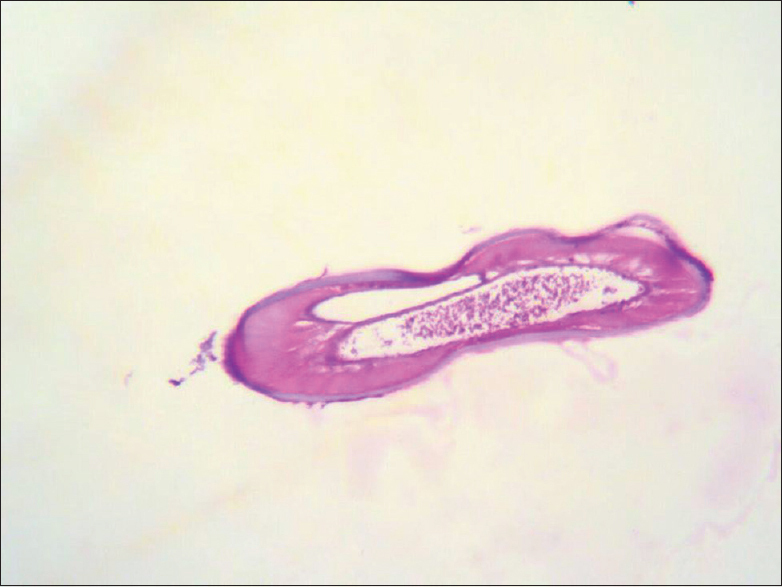 Microscopically, the sample revealed adult nematode parasites [Figure 1], [Figure 2], [Figure 3]; and, the skeletal muscle showed a cavity lined by granulation tissue having dense macrophages, mixed inflammatory cell infiltration, along with reactive changes of skeletal muscle [Figure 2]. 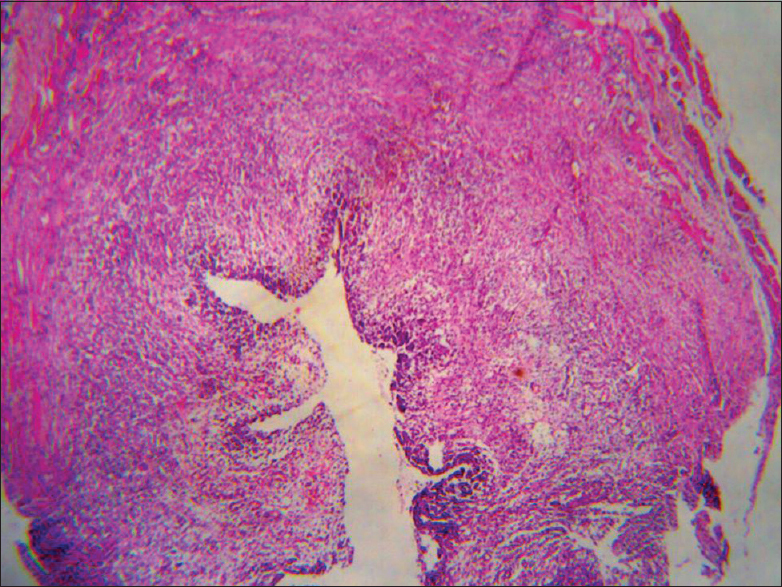 Findings were suggestive of dirofilariasis with abscess formation. 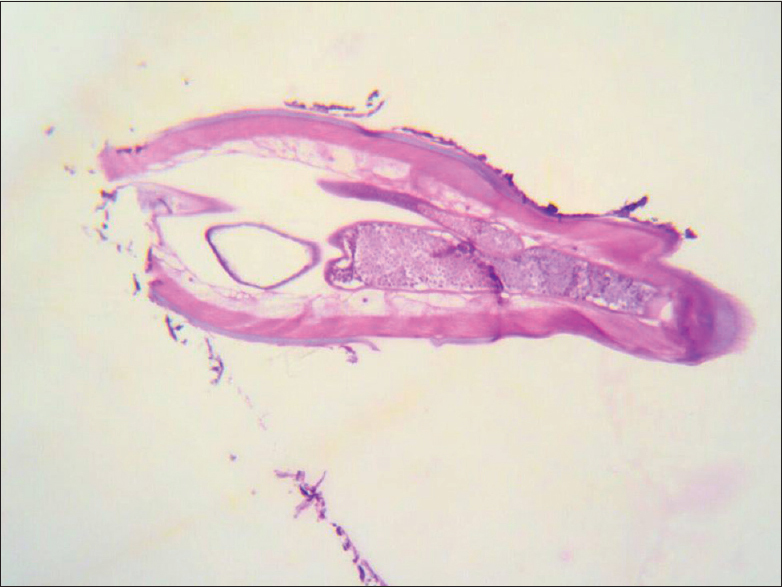 Diagnosis is usually made retrospectively as most cases are confirmed as Dirofilaria infection on excision of the subcutaneous nodules where live filamentous parasites are found; the species is confirmed later by histopathological examination. The ideal treatment modality is excision of nodules, followed by administration of antifilarial medications for a brief period. Complications are rare and recurrence is usually not seen. Follow-up is usually not required. No fatality has been reported so far. Perera J, Martinez R, Bravio G. Current directions in the immunodiagnosis of human dirofilariasis. Trop Med Parasitol 1994;45:249-52. Joseph E. Mathai A, Abraham LK, Thomas S. Subcutaneous human dirofilariasis. J Parasit Dis 2011;35:140-3. Faust EC, Thomas ER, Jone J. Discovery of human heartworm infection in New Orleans. J Parasitol 1941;27:115-22. Pampiglione S, Canestri Trotti G, Rivasi, F. Human dirofilariasis due to dirofilaria repens; A review of the world literature. Parasitologia 1995;37:149-93. Bhat KG, Wilson G, Mallya S. Human dirofilariasis. Indian J Microbiol 2003;21:65. Sabu L, Devada K, Subramaniam H. Dirofilariasis in dogs and humans in Kerala. Indian J Med Res 2005;121:691-3.